Many years after the death of her grandmother, Lulah Ellender inherited a curious object - a book of handwritten lists. On the face of it, Elisabeth's lists seemed rather ordinary - shopping lists, items to be packed for a foreign trip, a tally of the eggs laid by her hens. But from these everyday fragments, Lulah began to weave together the extraordinary life of the grandmother she never knew. A life lived in the most rarefied and glamorous of circles, from Elisabeth's early years as an ambassador's daughter in 1930s China, to her marriage to a British diplomat and postings in Madrid under Franco's regime, post-war Beirut, Rio de Janeiro and Paris. It was also a life of stark contrasts - between the opulent excess of embassy banquets and the deprivations of wartime rationing in England, between the unfailing charm she displayed in public and the dark depressions that blanketed her in private, between her great appetite for life and her sudden, early death. Throughout Elisabeth's adult life, the lists were a source of structure and comfort. And now, as Lulah learns that she is losing her own mother, she finds herself turning to her grandmother's life, and to her much-travelled book of lists, in search of meaning and solace. 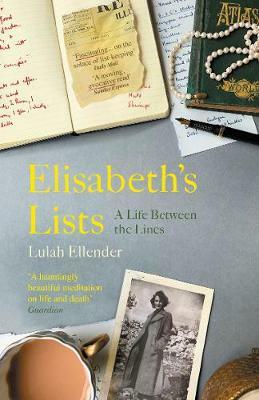 Elisabeth's Lists is both a vivid memoir and a moving study of the familial threads that binds us, even beyond death. Not only a fascinating exploration of an extraordinary women's life but a beautifully vivid story that superbly intertwines the lives of three generations of daughters. I adored this elegantly written memoir documenting the life of an extraordinary woman living an extraordinary life.